Learn how to become a 60-minute student with these powerful tips. According to Robin Sharma, the #1 purpose of life is to become who we are destined and built to be. If you think you don’t have enough time to find your best version and growing yourself, watch this video to discover hacks on how you can inject learning habits (60-minute student) to your daily routine. Perhaps joining the “Traffic University” is your answer. Enjoy! (5:27) — The deep truth you need to hear to let go of mediocrity and unleash your genius. How to rewire your brain to remove any negativity or doubt that may be holding back your potential. The 5 AM Club — A game-changing morning ritual that will regenerate your connection with your soul (and have a positive ripple effect on the rest of your day). The 60-minute Student — A completely different way to look at how you learn, which will fundamentally change the way you grow for the rest of your life. The 90-90-1 Rule — This is the single greatest secret of how the world’s super performers can regularly maximize their potential (and how you can do the same). What Robin Sharma did was, he extracted the single greatest trait that all the high performers share – the ability to remain inspired enough to see a great idea executed. And in this masterclass, he will share FOUR practices that will help YOU develop that trait. A trait that helps you keep going even when it’s tough. It will make you failure-proof. You will stay focused, brilliant and productive. You will own the industry. You will rock your craft. And finally see the changes happen – the ones you’ve been longing for, for YEARS. Robin Sharma considered being one of the top 5 leadership experts in the world. His work embraced by rock stars, royalty, billionaires and many celebrity CEOs. Robin didn’t always feel fulfilled — so he studied people with extraordinary lives. He developed a framework for greatness that can unleash the genius and legend in anyone. He then wrote the #1 International best-selling book, The Monk Who Sold His Ferrari, an instant global phenomenon. For 20 years Robin has refined and perfected his framework by coaching the leaders of some of the most impactful organizations on the planet such as NASA, Microsoft, Nike, GE, and Yale University. 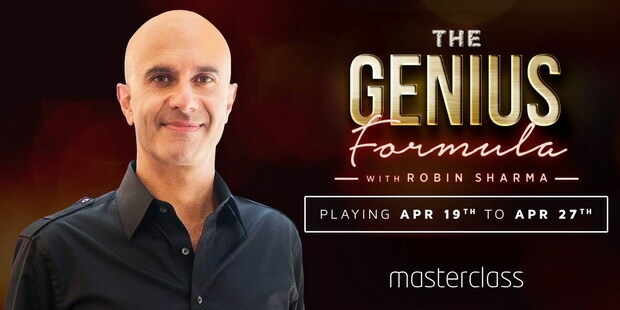 Today, Robin is on a mission to share his masterpiece framework to millions of more people.